Raised as Horse Guards 1660. Became 1st Regiment 1788. Present Title 1877. Raised as Horse Guards 1660. Separated as 2nd Regiment 1788. Present Title1877. 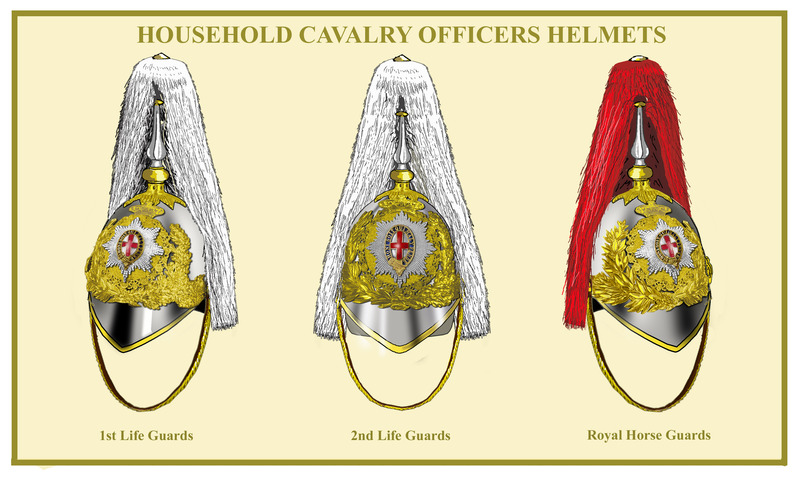 The Household cavalry adopted the Albert Pattern helmet in 1842. It had a German silver body with gilt binding on the peak. It was richly decorated with gilt leaf . The plume holder also had gilt decoration. In 1871 the helmet was modified by removing much of the gilt decorations on the peak. The plume holder became a fluted spike with a ball on the stem with a gilt eight pointed star on the base. The plume was white horsehair in the 1st and 2nd Life Guards and scarlet in the Royal Horse Guards. 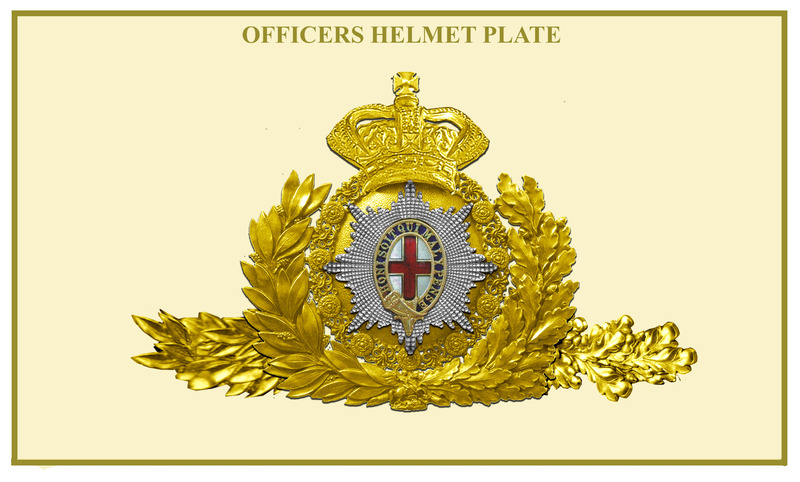 Unlike the Dragoon Guards and Dragoons who had dispensed with all gilt decorations except that around the waist, the Household cavalry retained theirs which was a laurel leaf spray on the right and an oak spray on the left. The Upon the laurel / oak leaf spray in front was a diamond cut silver Garter Star with an oval garter of blue enamel with the words “HONI SOIT QUI MAL Y PENSE”. In the centre was a red enamel cross on a silver ground. Above this was a large gilt Victorian Crown. 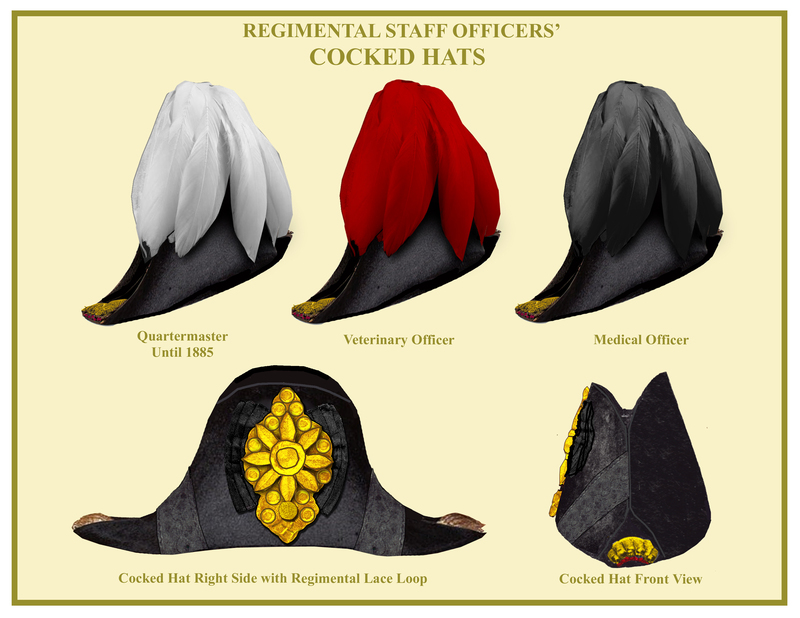 Cocked hats continued to be worn by the Staff Officers in the Household Cavalry after 1881 (along with the Foot Guards). With the advent of separate departments for Medical and Veterinary services, these had been abolished in line regiments. The post of Quartermaster remained on staffs but wore regimental uniforms after 1885. The cocked hat was silk in the Household Cavalry being 7 inches high on the left side and 6 ¼ inches on the right. On the right side a large black silk cockade and a strip of black silk oakleaf lace on each angle, front and rear. The left side was plain. On the opening each end was a gold bullion tassel, resting on a crimson base. The gold lace loop on the right side was of special pattern for the Household Cavalry. The swan’s feather plumes were white for quartermaster, red for veterinary officers and black for medical officers. Quartermasters wore regimental headdress after 1885.